The report is split into a number of sections. 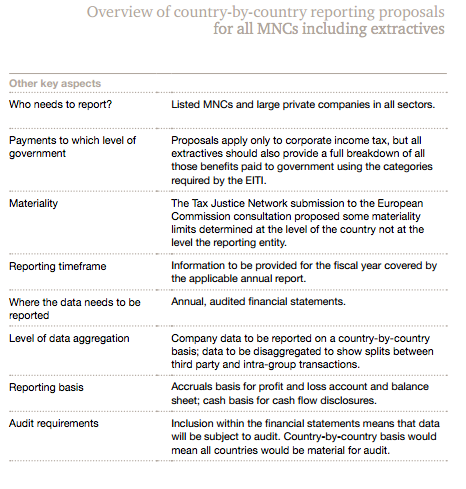 Inevitably the focus is on the extractive industries given the significant demand for reforms in these sectors in both the USA, where new legislation demanding some transparency for this sector is now in force (but subject to legal challenge from some of the world's largest oil companies including Esso, Chevron and Shell with BP sitting on the fence) and in the EU where broadly similar legislation is expected later this year. I do of course welcome that legislation and the attention that PWC are giving to it: I wrote the first ever report suggesting that such transparency should be delivered in the extractive sector using accounts back in 2005. It's good to notice they're taking this seriously. 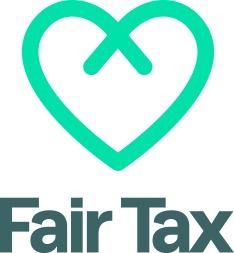 For the first time ever civil society is setting the agenda for accounting reform, and it's likely to stay that way. Accountants have to wake up and notice. They're here, here, here, and here. I'd suggest, as author of them all, that the first and third are now out of date. The second is important and the last the most comprehensive. So, what's the relevance of all this? 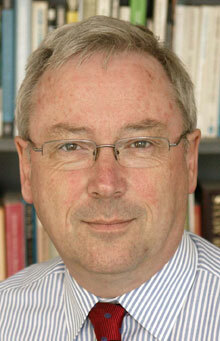 Simply that at last accountants are taking this issue seriously, having opposed it for too long. I'd suggest it's also time they now began to begin talking to us seriously about it too. Pretending we'll go away is no longer an option. You need to edit out the reference to the EITI if you are going to pretend to be the progenitor of this initiative, because it predates your own work by three years. Hope this helps with the truth-twisting! Have you read the pwc report, Gutbucket? 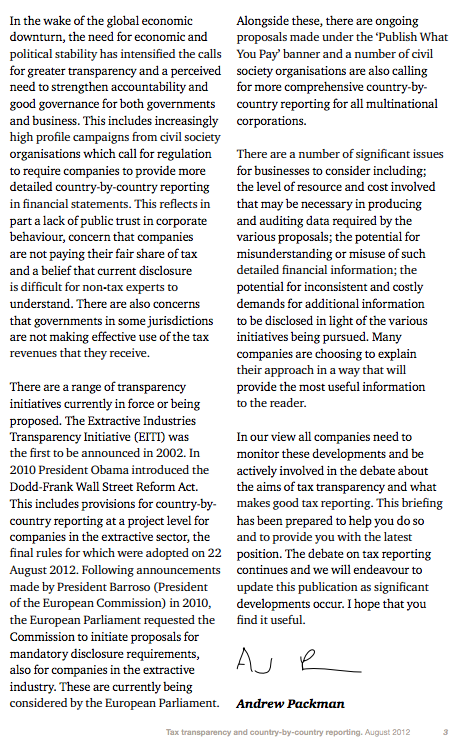 It’s all very clear that the EITI is not Country-by-Country Reporting. We need to be aware of the FRC/EFRAG discussion paper on accounting disclosures however, which using the cutting clutter argument are seeking to redefine what is material in accounts by almost silently defining who are the users of accounts. 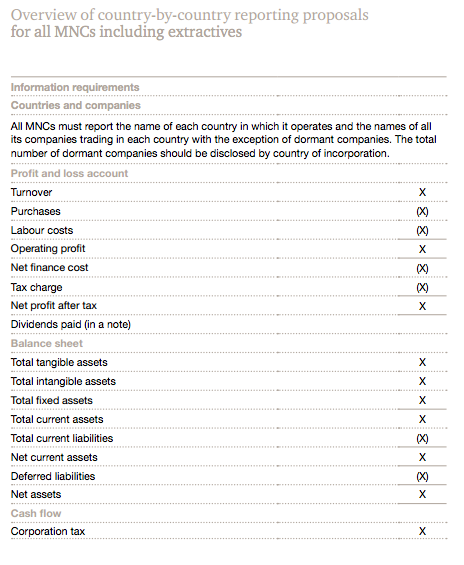 You may well find that CBC reporting is added to the disclosures within standards – but at the same time listed companies (and their auditors) take a much more agressive view as to what is material and is required to be disclosed. 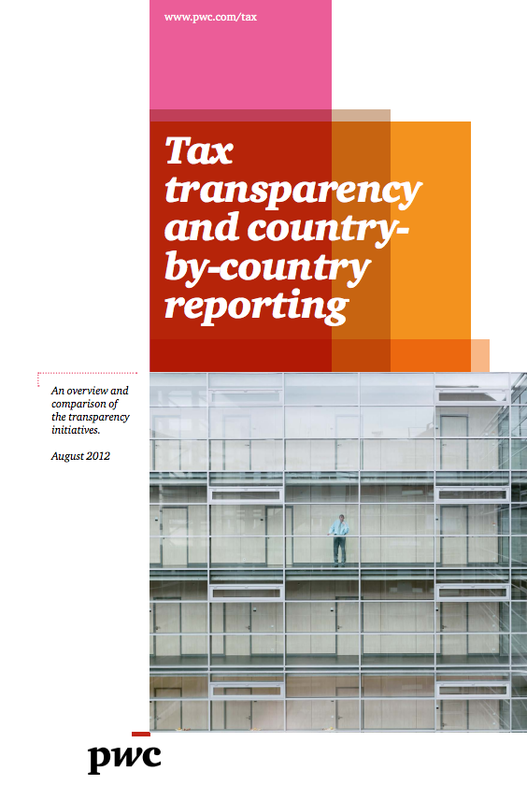 Within the accounting frameworks there needs to be a much better definition as to what is the general interest of the public and employees in the affairs of limited companies and how such public interest might consider materiality – I would see this covering not just tax but other matters such as remuneration, employee conditions, treatment of customers, the environment, independence of auditors, treatment of the environment, systemic risk created in the financial system etc. I all the community /employee involvement disclosures required were to be grouped together in a separate section of the accounts then this would probably address the clutter point.